My wife was cleaning up and found an old USB webcam / microphone that we bought for our daughter some years ago. So, I decided to plug it into my Linux Mint desktop and see what would happen. And… nothing happened. Turns out there are some applications in the Software Manager that can bring alive a webcam. The program that worked best for me is Kamoso. Once installed it will appear on the Graphics sub-menu. This is a cute little program that will show on the screen what the camera sees. And the program can be used to capture photos and video. There are also adjustments for hue, contrast, saturation, etc. Kamoso is a nice little program. Skype is available for Linux Mint. Signing up for a Skype account is free. And it is free to use the audio test capability in Skype, which is helpful to make sure the microphone and volume is working properly. In conclusion, setting up a USB webcam on Mint was rather simple. The solution is to use the Terminal, use the command “ls -R > filename”. The “ls” command lists files. The “-R” option causes the list to include contents of folders and subfolders. The “>” symbol redirects the output of the command to a file, named “filename” in this example. To use this, open Terminal from the menu. Navigate to the top folder you want to list. Then run the command. The result will be a printout of each folder, with the files within listed beneath the folder name. This should be easy to do. Then I realized I had not yet ripped CD tracks to MP3 files on Linux or Mint. I discovered Sound Juice in the package manager, so I downloaded and installed it. First problem: ripping to MP3 format requires another library called “lame.” So I downloaded and installed it. That got Sound Juice working just fine. Almost. This may be fixed in the future, but I needed a solution today. In poking around I noticed that K3b program will rip CDs, in addition to its other functions. And it works! Problem solved. Well, it was bound to happen sometime. The old hard drive in my desktop finally died. I tried the freezer trick. Lowering the temperature can sometimes nudge a hard drive back to health — long enough to grab some data off of it. That did not work. So, I will have to live with my full back-up, which was about 10-days earlier. 1) Replace defective drive with another old IDE drive, with 300GB capacity. 2) Boot the computer using the Mind 12 live DVD, which I still had from my first install of Mint 12. 3) After the boot up, I clicked on Install. When it got to the question about how to install, I selected the option to reformat the HDD and install Mint alone using the entire disk. 4) Once installed I re-booted the computer. Mint informed me there were Updates waiting, so I installed them all. This process actually took longer than the Mint initial install. 5) Went into System Tools > System Settings > Displays to configure my dual displays from Mirror (the default). 7) Launched Thunderbird. Then killed it, copied over my files from backup, and re-launched it. I’ve got all my old email back (except for the past 10-day after my last back-up). 8) Launched Firefox. Then killed it, copied over my configuration files from backup, and re-launched it. I’ve got all my bookmarks and preferences back. 9) Copied all my files from backup disk onto my main disk, using the default folders provided by Mint: Documents, Pictures, Downloads, etc. 10) Set up a few screenlets using Screenlet Manager. 11) Launched Me-TV and ran through the HDTV channel search. 12) Launched Picasa and let if find all my photos. That’s about all I have time for this weekend. I am using my Mint desktop with a USB mouse. Nothing unusual about the mouse. It is a Logitech wired USB two-button, wheel mouse that I picked up from a local office supply store. The pointer moves way too fast for my taste. Even my daughter said it was way too fast. With some experimentation I determined that the higher the number at the end of that command, the slower the mouse will move. For me, “3” worked out nicely. Another program I really like is Evernote. This is kind of a handy personal scrapbook. You can compose in it, or copy text and pictures into it, or even copy web pages into it. What makes it so special is that it syncs with all your computers. I can keep working on my projects in Evernote from any computer, whenever I want. 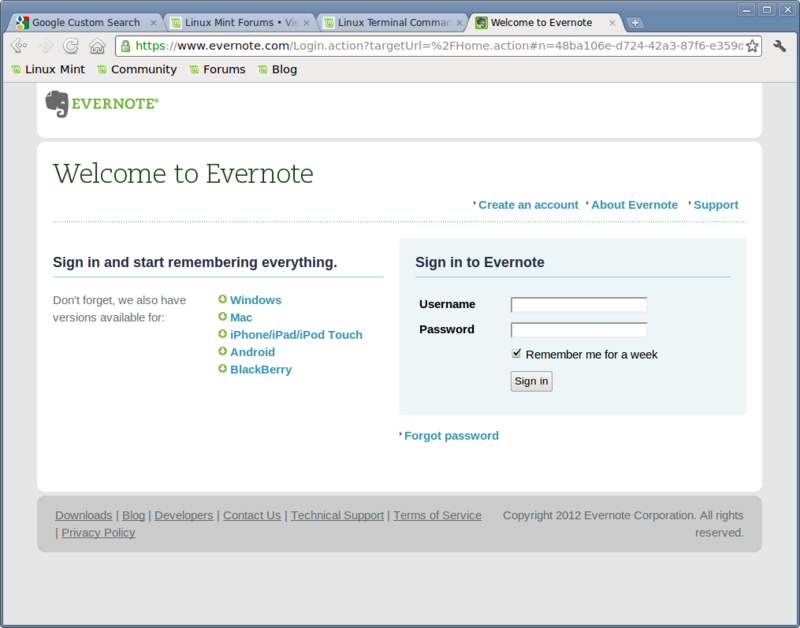 Evernote has a web version and a desktop version. Desktop versions are available for Windows and Mac. If you have the Evernote folder that was created during the Windows install process, you can copy that whole folder to Linux Mint and run Evernote with Wine. Or the easier way is to just use the web version on Mint. The web version and the desktop version all sync on all your computers. A good use for Evernote is to keep a to-do list. Here is a cute little program called Pixie that gives the exact color codes for any color on the screen that you can point to with the cursor (mouse). This is an old Windows program I have had for several years. It is really handy when you need to match colors exactly for web page development or other design tasks. Even though it is a Windows program, there is no install needed. Just run the .EXE program. 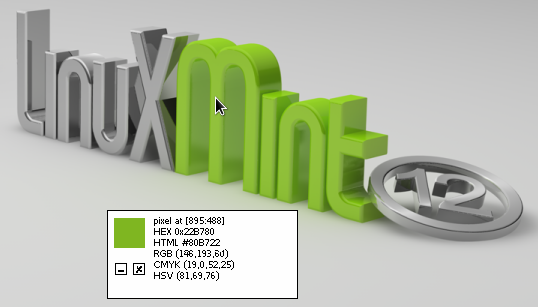 Here is a screen shot of Pixie telling me the color code of the green in the Mint 12 logo on the standard desktop.